That food-loving crime fighter, the Lunch Lady, returns in this, the fourth installment of the creative and very funny graphic novel series. This time we leave the familiar setting of the school building and head for the countryside, to cabins, lakes, campfires and -- the swamp monster! Hector, Terrence and Dee are all going to camp, and they are interested to see Lunch Lady and Betty arrive there, too. The kids are, of course, hoping for a fun and exciting time, but Lunch Lady and Betty are looking forward to some well-deserved peace and quiet. However, the strange goings on around the camp - including apparent visits from the legendary swamp monster - put an end to any of the time off that Lunch Lady was hoping for. When a popular counselor is attacked by the creature, the three friends are determined to help Lunch Lady any way they can. Here is an interview with author Jarrett Krosoczka at Literary Asylum. Enjoy! 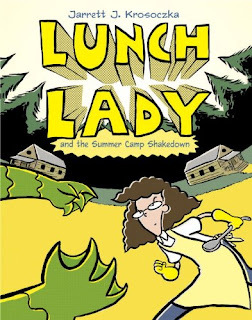 Booking Mama: "While I definitely enjoy the characters and the plots in the Lunch Lady books, I have to say that the biggest draw to me, as a parent, is that even the most reluctant readers will love these books." Books: "While the story is light-hearted, the novel touches on some serious and timely issues, including lying, bullying and jealousy." Comics Worth Reading: "Due to the lack of Lunch Lady focus and too much else going on, my favorite book in the series is still the previous, The Author Visit Vendetta, but kids who enjoy the series likely won’t have my qualms." My son & I read the first 2 but they just didn't thrill us. But glad to you and the girls are enjoying them! Yes, I know exactly what you mean Darla. You know my boy is autistic and has a hard time reading but right now he's having a blast with (what I might have otherwise called awful) that Ook & Gluk Caveman book by Dav Pikney. He needs lots of help but he's dying to read it everyday, which is a great feeling for me!